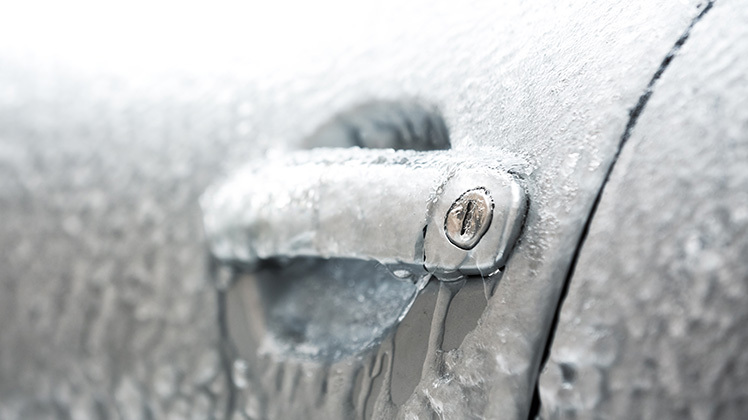 It doesn’t take a lot of water to freeze your car locks but, when it happens, it can create a lot of problems. The good news is that there are several ways to open frozen car door locks. First of all, check if all your doors are affected. You only need one door to open to be able to squeeze into the driving seat, turn over the engine and get the car’s heating system on. If that’s not possible, the quickest and easiest answer is to use a lock de-icer. These come in two forms: an aerosol with a special nozzle that directs de-icer straight into the lock or a heating element which warms up in the lock, melting any ice that’s formed. Some people find that spraying WD-40 directly onto the key has a similar effect. De-icer and WD-40 aerosols can also be used to prevent ice forming in the first place. You can create the same effect as the heating element by using matches or a cigarette lighter to gently warm your key. Don’t make it hot, just warm to the touch – and make sure the naked flame doesn’t go anywhere near the remote control buttons, as this could damage the computer chip. If you have a straw, you can also place this over the lock and blow warm air into the lock cylinder. If you’re close enough to your house to be able to trail an extension lead, try using a hairdryer to open your frozen car door lock. A hairdryer is also useful if the door seal has frozen. Another way to get around a frozen seal is to push as hard as you can against the door. The pressure should break any ice and so allow you to open the door. Whatever you do, do not pour boiling water into the lock. Not only could this damage any plastic components but most modern cars have electronics within their lock cylinders.